The Met Gala being fashion's biggest event of the year is always such an exciting time, and it normally consists of me religiously refreshing my Instagram news feed and adding any possible attendee on snapchat so I can absorb the atmosphere as if I were there, and pick my favourite dresses of course. This years met Gala theme was "Manus x Machina: Fashion in an Age of Technology." It was all about finding the line between handmade haute couture and machine-made fashion. Upon hearing this years theme I predicted lots of silver, chrome, mirrored and very futuristic - and the gowns didn't disappoint. As per usual, my mum and I went through the Vogue best dressed list and picked our favourites of the night and our... not so loved looks (to put it nicely). As I said early, like I imagined there was a running theme of very mirrored extra sparkly gowns, especially from Balmain. My favourite gown of the evening definitely has to be this absolutely gorgeous Zac Posen dress worn by Claire Danes. This couture number stole the entire 'show' in all its cinderella esque glory. 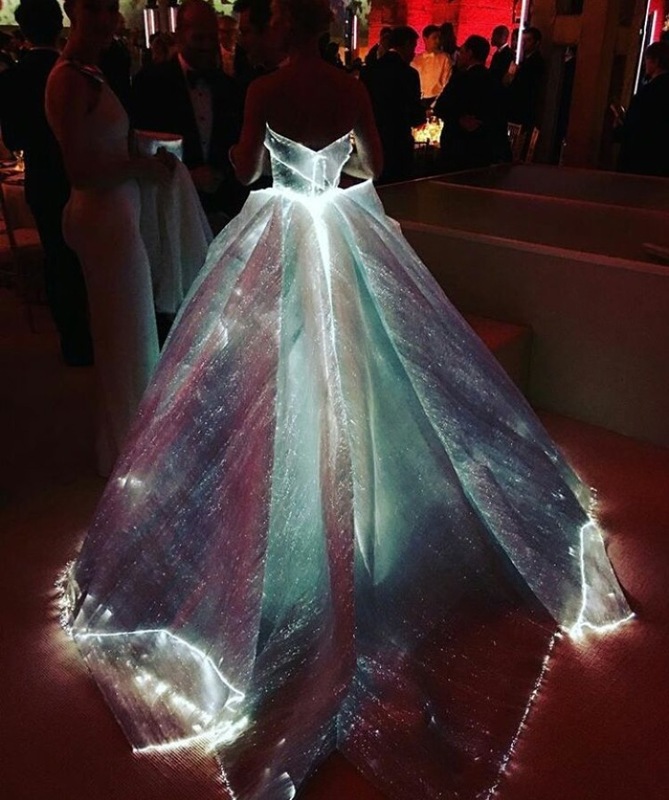 But just when I thought I couldn't love the dress anymore; I saw the photos and videos of how it lights up in the dark and creates this 'princess like' irredescent shine. All I can say is that I would happily live in that dress! My next favourite gown of the evening has to be this beautiful Marchesa embellished dress worn by Karolina Kurkova. Again with the lovely soft blue going on lilac colour scheme, this dress is another one I would sell my entire wardrobe (bags and shoes included) just to own! I absolutely love the floral embellishments that create such a mystical, magical and fairytale like feel! Another gown I fell in love with the second I saw it was this Zuhair Murad design worn by Hannah Davis! Again, it has such gorgeous intricate detailing that makes the dress stand out and compliments it well. Very different from my other favourite so far, is this amazing black Givenchy gown worn by Bella Hadid. My other favourites have been very light spring/summer colours however on the complete opposite end of the spectrum is this elegant strapless gown with a ruffled skirt... ugh I'm in love with it! Going back again to the lighter colours is Kendall Jenner in this Atelier Versace dress. I love the cut outs and the slim structure compared to the other very ball gown like dresses (that I equally love). I also love the high neck with the tied back pony tail works well with! There isn't likely to be a time that Blake Lively doesn't look like the epitome of elegance, and this gown didn't break that record - this gorgeous soft pink gown with a long (yet surprisingly not the longest of the evening) trail by Burberry was truly something out of a princess book. Another gown that stood out to me was this gorgeous floral sheer gown by Dolce and Gabbana, worn by Zoey Deutch. There is something so lovely about the busyness of the dress yet it somehow still manages to act sophistically simple. Much like all the lovely people who attended the Met Gala; Rosie Huntington-Whitely is able to make anything look elegant. And what a better way than to do that in this gorgeously simple white Ralph Lauren gown. I'm always a fan of a lovely simple dress, and Rosie pulled it off so well! Olivier Rousting certainly bought an army with him... well, a Balmain army. The Balmain gowns all followed the theme of 'manus x machina' as they arrived head to two in crystals, metallic embellishments and belts!! No army's ever looked to good, haha! Nicole Kidman came in a gorgeous Alexander McQueen gown; embellished head to toe! I love this very slim fitting and flattering gown with cut outs and a cape as it definitely follows the idea of the theme! Adrianna Lima looked picture perfect in this intricately embellished Giambattista Valli gown that caught my eye immediately! Again, in a very princess like gown is Nina Dobrev also wearing Marchesa. The gorgeous 'flowyness' of the gown and the soft gold colour is so lovely and definitely one of my favourite designs of the night in fact Marchesa was definitely one of my favourite desginers of the evening. Some people will see this pick and think "Maija are you sure?" but that is exactly what I thought when I first saw it! However when you get passed the boots, and really start to look at the dress you start to appreciate the uniqueness of the dress. Louis Vuitton has recently articulated quite an original style which comes through with the leather accents and well, the boots! And last of all is another Louis Vuitton favourite of mine of which is this lovely simple, elegant and sparkly gown worn by Lea Seydoux. Lea kept it extremely simple compared to some other gowns, and yet this dress may still be one of my top top favourites!